Edward Snowden was just six when the Berlin Wall came tumbling down and with it, more than three long decades of a Cold War. But he’s managed to revive the good old fashioned game of Kremlinology. Unnamed sources trade in rumors of lights going off or on the upper floors of embassies, the police cordon off a plane carrying no one special, and politicians split hairs over double speak. Any wonder that ever since Snowden George Orwell’s 1984 is selling like hotcakes on Amazon? As much as Cold War nostalgia lurks in the shadows of the Snowden story, back in the day no one took comfort in what now look like the ideological certainties and clearly drawn lines of the US:USSR faceoff. Sure, songs like 99 Luftballoons and Russians (in which Sting hoped the Russians loved their children, too) still sound sweet but the existential fear that the world might end via mutually assured destruction was anything but. Those songs were hits right around the time Snowden was born. Back then Ronald Reagan was in full swing and a guy by the name of Mikhail Gorbachev was just about to become General Secretary of the Communist Party of the Soviet Union. Gorbachev introduced a little policy known as glasnost, defined in English as “openness.” At the time it meant that the Soviets would allow open discussion of political issues, freer dissemination of information, and more government transparency. This new openness ultimately helped bring down the Soviet Union although it’s debatable how much this reduced corruption and repression in Russia. Now, the word has been re-purposed. It’s currently used as the name of a computer diagnostic about the effects of an ISP on traffic flow (a “glasnost test”). It also survives as Glasnost: The Game in which the goal of each player is to disarm as many countries as possible. The most disarmament wins. 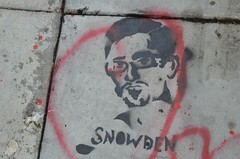 Can openness save the world or is the glasnost of Snowden and Assange just another game of mirrors? In short, are we back in the USSR? Paul McCartney first wrote that song in 1968 for the Beatles’ White Album but he remained persona non grata in the Soviet Union all the way until the end. He finally got to sing it in Moscow’s Red Square in 2003. The crowd loved it. This week, it sounds remarkably fresh. Yes, we live in interesting times! I guess history didn’t end after all when the Cold War did. No, weirdly enough, it never does.